Sign Language- What Nice Girls Don’t Say! – Who Dried My Jeans?! Sign Language- What Nice Girls Don’t Say! These techniques decreases the chance that my family will have to call 1-800-x-or-cism later in the day. I walked out into the family room, forced to leave my warm bed due to adult responsibilities, and remarked obnoxiously, “gosh it’s freezing out here, why isn’t the fire on”? Settle down, breathe deep, just get your coffee and you’ll be fine. I turned on the fire, myself!, as I walked to the coffee pot. I then sat down in my spot on the chaise, covered up with my faux throw, and grabbed my “Breath” Bible study. I needed to soak something in quickly before I started a load of laundry and got in the shower. Haley was adamant about being right in the middle of my lap and under my throw. I would have welcomed her with loving arms but I was questioning her motives. I’m not sure that she particularly wanted in my lap as much as she could see that I was enjoying holding my book and coffee, like one of her siblings, and wanted them out of my arms and her in their place. Do you know how it feels when someone is purposefully hanging out approximately 1 inch from your face and won’t move because they think its funny? Or, could you imagine having someone follow you around all day tapping, at a high tempo, on your upper trap? How about trying to help your 5th grader show five different Common Core ways to solve 2+2 while kids are fighting in the background about whose turn it is on the Ipad? All of these scenarios described above, going on simultaneously, plus being hooked up to a wide open IV of caffeine, is how hormones can make you feel. I wish my husband could experience it just one month. Then he may be more willing to “let ‘er roll” for just a couple days knowing I am struggling with all my might to keep myself from becoming “one hot mess”. With only frustration found from my coffee, book, and cuddling, I got up to start a load of laundry. One of my children, not Sophia she would want you to know, wet the bed last night. Accidents happen though don’t they? I wonder who didn’t make him/her pee before getting in bed last night? And if he/she would sleep straight in his/her bed like a normal person, I wouldn’t be having to wash a pillow as well as the sheets, blanket, and mattress protector. That will take a whole extra load! Who pees on a pillow when they wet the bed! Hey Rick, I’m going to take a quick shower since I have to do some laundry before work this morning. I want to make sure you have hot water. I’d probably gouge my eyes out with a fork if I have to listen to you complain about getting a cold shower. I go through my morning routine trying to avoid contact or interaction with anyone, following strategies #1 and #2. The bus would be here any minute and I had told Harrison about 10 minutes ago to start getting his high-tops on. These are a controversial new pair of high-tops. Rick and I both swore we would never buy another pair. However one day, a couple weeks ago, Rick and Harrison came home from Hibbetts with them. Rick walked in the door cautiously, bringing with him a thorough explanation as to why he found it a good idea to buy him another pair. 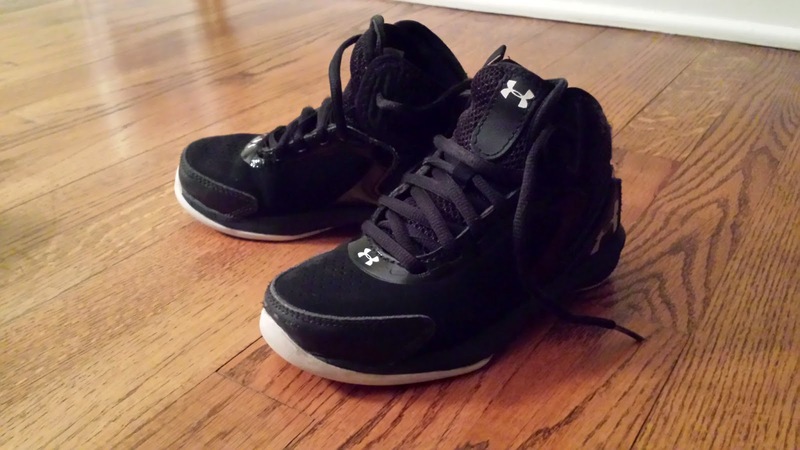 His argument included: they were exactly like his basketball shoes, they were on sale, and my favorite, Harrison had promised him he wouldn’t cause us a bit of trouble over them ever again. Are you kidding me! That kid couldn’t keep a promise to breath! You see, in order to get his high-tops on he has to loosen the laces completely. Then, even though instructed otherwise, he still grabs the laces by their ends and gives them a big pull. He then throws a fit when he can’t get the laces below to tighten up and lay down flat. I don’t remember Rick promising ME he would help Harrison get those shoes on every morning before he left for work. He also didn’t buy 2 locks that would require a key to get them off again at bedtime. I applied some lavender oil to my wrists and temples before leaving the bathroom to check on his progress. Hopefully, the fragrance would help me refrain from getting out my electric knife and cutting those family destroying, high-tops off at ankle level. I’m still struggling with strategy #2. 1 & 2 are on the bus and I run into the house knowing that 3 just needs her teeth brushed. “Mommy, you don’t do it bery good, I want Daddy.” “Daddy’s not available right now and I’m going to brush your teeth this morning- whether you like it or not.” “You always get tooth paste on my face.” “See wook”, as she turns to the mirror and points at her face accusingly at me. “Maybe if I wasn’t freezing cold from waiting on the bus in Arctic temperatures my hand wouldn’t be clawing up with poor dexterity.” “It’s so dumb that I have to stand out there with them anyway.” “They play outside, poorly supervised, all the time.” “I simply do my chores occasionally peering out the windows, pecking and give a reprimanding look when needed, and THEY’RE ARE FINE!” “Haley, it is not healthy or effective to use such definitive verbiage in a heated argument- like your father does to absolutely shoot me through the roof “ “Yes, this morning I did get toothpaste on your face but I do not ALWAYS get toothpaste on your face. However, you, absolutely NEVER sit still while I’m trying to avoid the wrath of my dentist father who haunts me with the reminder that none of his kids ever had a cavity! It was time for me to leave. I was feeling happy that I didn’t have on black pants. They were gray. Things were looking up. I had finally gotten to the cleaners yesterday and had a mini Christmas experience forgetting what I had left there. I don’t use the dry cleaner as much as I should because my husband’s, lets say thriftiness, has rubbed off on me. I do try and run by at least every 60 days because they have a sign reading: ‘Any garment left more than 60 days will be given to Goodwill’. I just run in and holler like I work for myself, “do ya’ have anything for Leatherman”? Most of the time they come back reporting nothing, but on occasion they do! I pretend other people do this as well and consider it a normal practice. By the time I was in my car I was even irritating myself. If only a solicitor would call me now. That would help me let off some steam. Especially one I CAN”T understand. The inability to comprehend what they were saying would remind me of the rest of my morning. I lacked any ability to focus more than 5 seconds and was unable to follow through with even the simplest request. Wouldn’t it be refreshing to have a slow speaking, redneck solicitor just one time? I might just listen to what they have to say. While I continue using strategy #1 & #2 at work, #3, Sign Language, comes in very handy when you’re in the public. I’m usually very sensitive and loving with my patients. However, on mornings like this, when I’m struggling to tame my dragon, it helps me if I hold up imaginary signs. I think about what they say and it helps me deal. For example, ‘PLEASE SHUT YOUR FACE!’ said like Chris Farley, is a favorite. Or, The SOUND of your VOICE is making my ears SIZZLE with PAIN! I just sit there smiling, holding my sign and I feel the sun shining. Sign language is also effective when you’re driving and all your young, innocent children are in the car. “OPEN your EYES, DRIVER’S ED. DROP OUT!” I have other signs that I hold up but my mother wouldn’t approve of me reading them to you. Halfway through my busy morning, I discover that my new, bright-red, $3.99 clock is 20 minutes behind and slowing. I’m swamped today and can’t run late. I feel apologetic about what I’ve put my pants button through over the past few months. I am now experiencing the pressure and responsibility that I had been placing on it to “hang in there”. I couldn’t wait to go to Walmart on my lunch break. I knew I could leave there with a new, better clock and a free pack of AAs for my inconvenience. However, maybe by the time noon hits, a baseball bat, me, and the clock, in the parking lot might provide ample satisfaction for the $3.99 loss. As the irritation and anger dissipates, an irrational urge to cry sets in. Commercials aren’t even safe. I won’t go into this because it isn’t nearly as funny as irrational anger and irritation. I guess it will continue on like this, a couple days each month until menopause set in. I hear that can make you a nut case with hair on your face real quick. The future looks bright. My dear brothers, take note of this: Everyone should be quick to listen, slow to speak and slow to become angry, for man’s anger does not bring about the righteous life that God desires. James 1:19-20. I am so thankful Lord, that you know my heart’s desire and are patient with me day after day while I grow and learn!